If there is one thing a Politico knows how to do better than anyone else in the galaxy, it's talking. A Politico can talk to anyone about anything. What others accomplish with might and fear, a talented Politico may well achieve with a few well-placed words and a decent plan. 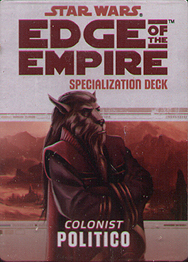 This deck requires the Edge of the Empire Core Rulebook and includes cards for all 20 talents available in the Politico specialization.